Adventure Island, west of the pier, has a palisade type fence, and a short section actually overlooks the site. This is the former Peter Pan’s Playground end rather than the boating lake bit. You can lean on the fence and look down onto the Dragon’s Claw ride, which spins you around in two directions and then turns you upside, and also the Go Kart track. The recording starts off with the putter of the single seat Go Kart engines then a couple of toots on a horn and a recorded announcement that the race is now over. You might also be able to hear the clatter of the riders leaving the Dragon’s Claw ride; it has a stainless steel floor. There is the noise of the park in general, and at 1.41 a whirring as the Dragon’s Claw ride begins, then shortly after as it begins to turn the riders upside down, voices, Polish I think, screams, and laughter. At 2.27 there is a loud crash, for some reason a two seat Go Kart (they alternate) on an almost empty track completely missed a corner, didn’t even slow down but ran straight into the safety tyres. You might just be able to hear the recorded “Use your brakes! Use your brakes!” insistent and after the event. The announcements seem to be new; I don’t remember them from last year and certainly not so often. The Dragon’s Claw continues. A motorbike passes, a Harley Davidson, not full dress but going that way. The Pacific Coast Highway runs from south of Los Angeles to north of San Francisco, but this Harley was going from Southend, heading to Westcliff and Chalkwell. The riders clatter off and the Go Karts continue. This was a Sunday evening, about 7.50. The weather had been nice so things were ticking over, but in a couple of weeks when the schools break up there will be an initial surge when mums try to entertain their kids. Later on during August there will be more people about and numbers will ebb and flow as people have time off and the weather settles down, or not. It will be much the same in Clacton and Walton I imagine. 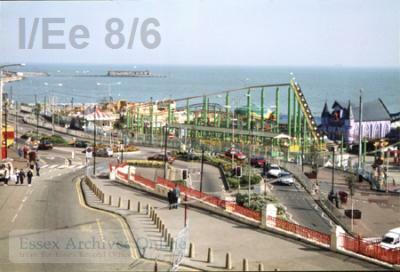 Image of Adventure Island by Douglas Whitehead (I/Ee 8/6). Been thinking about, just need to fit in and you really need to be able to have a “quiet” spot where you can just sit and wait without looking suspicious. Fun! Thank you. Do you fancy going back later in July or August to compare the soundscapes? Or even in the autumn?